Okay, so I’m an old-fashioned girl at heart. While I may be computer friendly and blog happy, I still like to use a more traditional writing method on occasion. I have my writing routine, of course: a propeller pencil for rough stuff; a black gel ink pen for the neat. But the other day I suddenly found I’d run out of leads for the pencil, and all of my pens had dried up and so into the bin they had to go. Most pens these days pretty much represent the epitome of our throwaway culture: use them once and then they’re done. Plus all these throwaway pens are made of plastic, of course. So when my last pen ran out I thought, easy, I’ll dig out my old fountain pen. It wasn’t far either, just sitting in my pencil case, waiting to be rediscovered. But, alas, my fountain pen uses cartridges. Plastic cartridges. Are these any better than buying a new pen every couple of months I wondered? It’s probably 50:50. At least they’re smaller, but maybe this means I’ll go through them quicker. And besides plastic is plastic at the end of the day, isn’t it? How am I going to get around this one, I wondered. I wasn’t quite prepared to resort to using a feather quill. In the end, I took myself off to WHSmith to see whether or not you can still buy traditional, refillable fountain pens with little glass pots of ink. Well, you can, sort of. Instead of having to buy a whole new pen, I came out with a ‘cartridge converter.’ It fits in my Parker pen just like a cartridge does, except it’s got a little mechanism built into it that enables me to refill it every time it’s empty. It’s made of plastic, of course, but at least it’s going to be staying in my pen for the foreseeable future. As for my propeller pencil, new leads come in little plastic tubes, packaged on cardboard, but with a plastic bubble over the top. I can’t do it, can’t buy this, it’s silly when there are plenty of perfectly good wooden pencils in the world. I go home and take a peek in my pencil case: yes, there’s one already in there. But wait: shock! Horror! It’s made of plastic! How weird. On closer inspection, it turns out that this pencil – a left over stocking filler from last Christmas - is made of recycled plastic. So that’s where all those plastic bottles go. I wonder how many bottles it takes to make one pencil? It looks like it needs a good sharpen, though, and so it’s back to the shops for me. I’ll just get a nice little silver sharpener, I think. Of course, it’s not that simple. WHSmiths has loose plastic sharpeners, or packaged metal ones. Why aren’t the metal ones loose? They’re no more in need of protection than plastic ones – less if anything, seeing as they’re considerably less brittle. Eventually I choose the metal one that comes with slightly less packaging, even though it’s a little more expensive. My cartridge converter came in plastic, too, as did the bottle of ink. 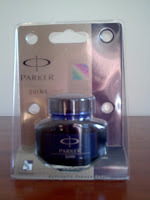 The pot of ink is in a glass bottle – great – but the sheer amount of plastic wrapped around it gave me a bit of a scare. In the end I bought it, figuring the pot would last me a while, at least, and in the meantime I can try sourcing pots without the packaging. When I got home, I opened it up with glee, ready to fill up the special cartridge – and forgot about how messy ink is and how easily it spreads itself around on desks and over fingers. Well, at least I haven’t knocked the bottle flying. Yet.